Only a real muenster would think today’s food holiday wasn’t the cream of the crop. July 30 is National Cheesecake Day! New York style cheesecake. Dense, usually made with heavy cream or sour cream. Pennsylvania Dutch style cheesecake. Relies on tangy cheese with larger curds and less moisture content. Philadelphia style cheesecake. Lighter texture but richer flavor than New York cheesecake. Take that, Big Apple! Cheesecake kludys. Pittsburgh’s answer to Philadelphia: this regional favorite is semi-sweet and usually served with fruit. Downside: you’re probably in Pittsburgh if you’re eating it. Chicago style cheesecake. Deep dish. Err…scratch that. Firm on the outside, soft and creamy in the middle. There are even more interesting international varieties. Smoked salmon cheesecake is popular in Scotland, while German style cheesecake uses quark. The Italians use a ricotta-like cheese, while the Greeks make theirs with a goat cheese known as mizithra. No matter in which region or country you’re eating cheesecake, I’ll bet you’re licking your lips as you enjoy every last creamy, decadent bite. 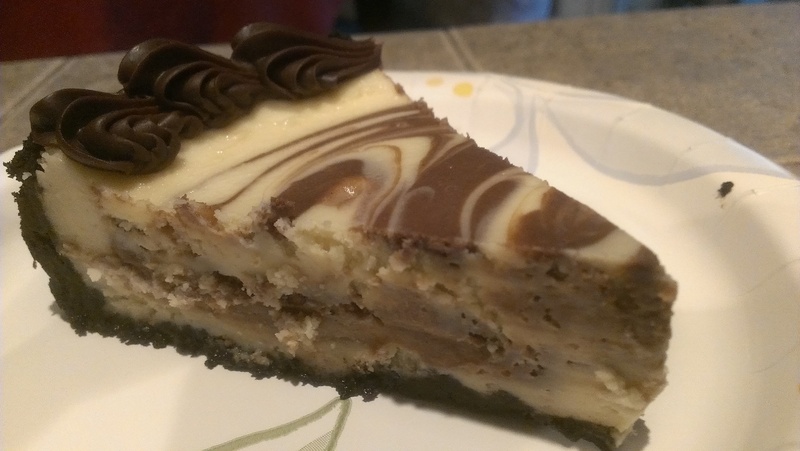 To celebrate, Tara picked us up a slice of “Portland-style” chocolate swirl cheesecake. Apparently this includes hipsters, bicycle spokes, and beards. Actually, I couldn’t find any information on what constitutes a “Portland-style” cheesecake. But I also stopped caring after I took a bite. Mmm! But I think my Aunt Mary made the best cheesecake of all-NJ style! No doubt about it, Aunt Mary’s is delicious! One of the best things about Christmas. Mine, too. It’s hard to have a bad day when cheesecake is on the menu. I need to make one. At least once. I’m kind of shocked you never have!